Limited edition of 1,000 pieces! Polystone statue sculpted in actor Peter Hambleton's likeness! Sculpted by artist Greg Tozer to an exacting likeness of the character played by Peter Hambleton in the movie, it's The Hobbit An Unexpected Journey Gloin the Dwarf 1:6 Scale Statue! This polyresin statue measures 9 1/10-inches tall x 9 1/10-inches wide including base, and it's a limited edition of 1,000 pieces. 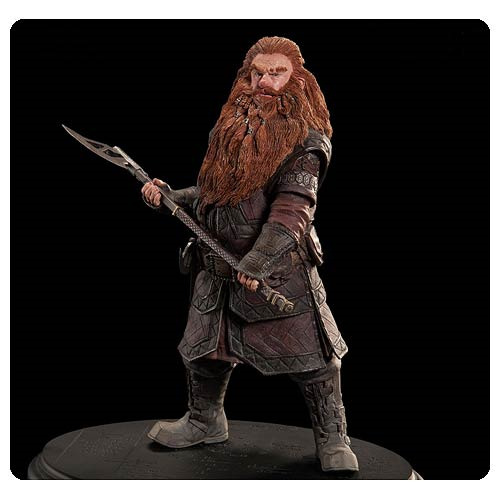 He's another must have edition in the line of 1:6 scale statues from Weta Collectibles, and the statue finds Gloin looking proud, carrying his intimidating axe. As adroit with weapons as he is astute in business, Gloin is a stout but sturdy warrior and wary of both Elves and the Wizard who leads their Company to Rivendell. He mistrusts the hand of friendship that Elrond extends to the Dwarves and councils a quick departure. Ages 18 and up.